Despite her age, 89, her deteriorating eyesight, and her diminutive stature, filmmaker Agnès Varda's command over the screen and identification with her subjects remains indomitable. And that's because in "Faces Places" she continues to capture the unalloyed countenances of all the figures who appear in the frame, including her own. Varda's latest film documents her collaboration with an enigmatic French photographer who goes by the pseudonym JR as the pair travels to visit with and photograph the faces of residents living in various bucolic small villages in the French countryside. JR then enlarges the portraits of the everyday people into huge posters and plasters them onto buildings, houses, and other structures that are significant both to the identities of the people photographed, and to the character or history of the specific setting. "JR is fulfilling my greatest desire," Varda explains in the beginning of the film. "To meet new faces, and photograph them, so they don't fall down the holes in my memory." In many ways, Varda's and JR's road trip becomes one marked by self-reflection. Not only do they get to know and bond with the often-marginalized individuals residing far outside the capital city of Paris-such peripheral figures and communities have figured greatly in Varda's work for many years-but the diametrically opposed duo, at least visually speaking thirty three-year-old JR towers over Varda's tiny, nearly 90-year-old frame, form a unique friendship that pervades the screen. Unlike Varda, who has been very visible throughout her career, little is known about the identity of photographer JR- which is perhaps why Varda is so drawn to him. Throughout the film, JR's face is completely concealed behind dark sunglasses and a bolo hat, which reminds Varda of French film giant Jean-Luc Godard, who she recalls fondly (at first). Varda persistently asks JR to reveal his face and he does, but not until he sees her in a particularly rare, raw emotional state triggered by memories of Godard and her late husband, filmmaker Jacques Demy. In this moment, JR really sees Varda for the first time, unadulterated, and so she too should have the chance to see him without his disguise. But while we witness Varda's tears in close up, we are only privy to JR's unmasking from a far because for filmmaker Agnès Varda, it's always been personal. From her earliest work in photography, to films like the French New Wave tour-de-force "Cléo from 5 to 7," to the eponymously titled "Beaches of Agnès," Varda, the artist, has somehow always been present. And somehow she was almost within reach. But only now in "Faces Places," Varda is here and she is reaching back. 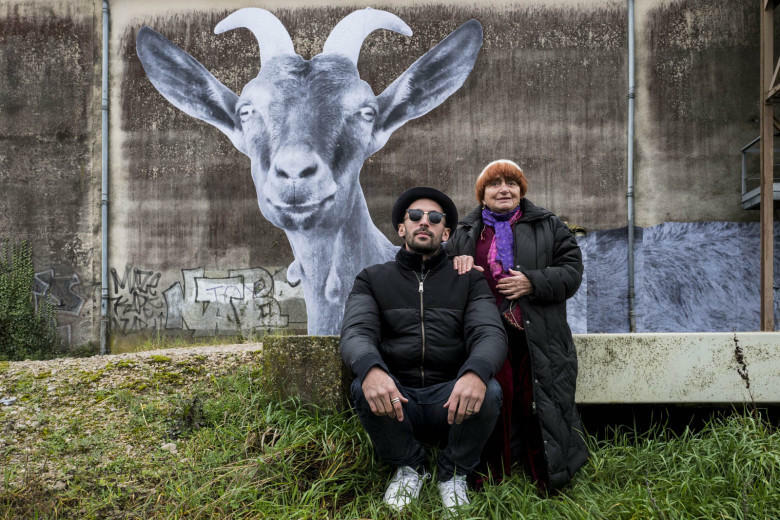 "Faces Places" (distributed by Cohen Media Group) opens in New York this Friday October 6 and in Los Angeles on October 13. In French. 90 mins. To watch a trailer for "Faces Places" click on the video player below.